A new way of working is in the air. 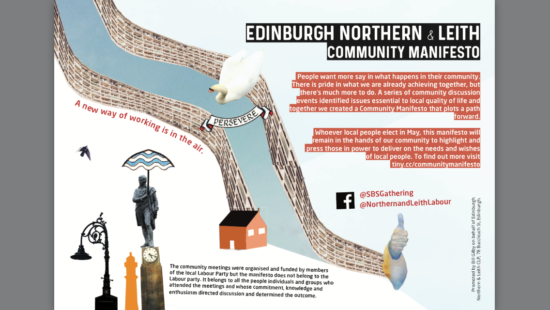 That’s the bold, cheering and challenging statement at the start of the Community Manifesto which has emerged from a series of community discussion events in Leith and north Edinburgh. Can we turn words into actions? Take a look at the community manifesto. It’s a resource for discussion as we race towards the local elections on Thursday 4 May. Closely followed by the snap general election on 8 June. Use it when candidates arrive on your doorstep. Return to it again, and again, whoever we elect to represent us in Edinburgh City Chambers – and the House of Commons. More power for local people? More power for local people was a recurring theme at the community discussions. It runs through the manifesto which offers pledges for improving life in our neighbouring communities. Others are bigger, more ambitious aspirations for affordable housing co-operatives and a sustainable green economy which will require new policies and legislation in Holyrood and Westminster. ‘Take party politics and profit out of housing’ was a heartfelt plea which echoed from the very first meeting. Which is where we, as citizens and voters, have a part to play. The community manifesto, as you can see on the last page, is the result of community discussion events which were sponsored by local members of the Labour party. But it does not belong to Labour, it belongs to the people who took part in non-party-political discussions which attracted people from many political persuasions – and none. ‘Take party politics and profit out of housing’ was a heartfelt plea which echoed from the very first meeting. The second two meetings – in Newhaven and Easter Road – brought together many different local people with shared interests in finding solutions to social issues which are both local and national. (See more on the Wall of Success ). Can politicians involve local people more effectively in decision-making? Is it possible to shift the balance of power between central and local government? How can we ensure that further devolution means a genuine role for local communities? A movement for greater grassroots involvement in democracy is emerging in many parts of Europe. Can we find the energy and commitment to catch and harness the mood of the moment, to build on the urgent need for a new way of working? Whoever we elect on 4 May and 8 June, these are questions we need to keep asking. Side by Side aims to keep an open conversation growing. Next Next post: Welcome to Leith: how to create a sense of belonging?